books Brecht’s Poetry: Angry or Evil? ‘Could not be friendly’ is a discreet but painful understatement, a too amiable hint at horrors. Dark times mean not only that terrible things happen to the world and to us but also that we have had a hand in the terrible things. In a remarkable late poem Brecht imagines a loved landscape has changed, suddenly let him down. But it hasn’t changed. He has remembered where he is in moral time. A bowl of slops, don’t touch it! The fuchsias among the snapdragon cheap and showy. There are things you don’t know! I cried. Or there could be silence. Brecht covers this ground too. But rather: it was when the housepainter trampled the workers. But rather: when the ground was being prepared for great wars. But rather: when the great powers united against the workers. But rather: why were their poets silent? There is something clunky and too correct about the party line here – the house painter was far more ecumenical in his trampling – but the prophecy of the final question is eloquent and looks forward to the title of a Heinrich Böll novel: Where were you, Adam? Where were we when the unfriendliness got out of control? Every heart will surely be lacerated. Surely you must see that? Brecht is attentive to all kinds of weakness and forms of helplessness that he doesn’t have, and the ones he does have tend to make him an expert rather than a hypocrite, the man who will never cast the first stone. We remember too that the cry in the diary was not an address to an individual conscience but a dream of other, kinder minds. Their way into the crew’s quarters. 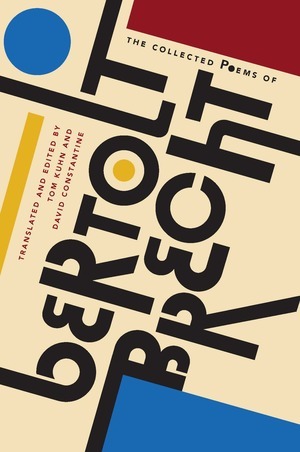 Kuhn and Constantine tell us that ‘less than half of [Brecht’s] output of poems was published by the time of his death in 1956,’ and every description of the opus sounds dizzying. The 1976 selection of translations edited by John Willett and Ralph Manheim contains ‘roughly five hundred poems’, while a German collected edition of 1967 has ‘approximately one thousand items’. The new book tells us that the latest complete works includes ‘more than two thousand poems’, of which ‘over twelve hundred’ are translated here. I don’t know whether these numbers in themselves suggest variety or the possibility of a lot of repetition. Brecht’s style and diction are pretty consistent, witty, idiomatic, often close to ordinary speech, never far from the song or the ballad. The literary forms he uses are very diverse, though, and I’m not sure I can name them all. Among them are narrative poems, lyrical meditations, fables, aphorisms, maxims, instructions, polemics, parodies, satires, handbooks, elegies, songs from plays, sonnet sequences, prose reflections and an imitation of a book of devotions. I was delighted to see in this book a connection I didn’t know Brecht had made: one of the lines from the song celebrating the dark skills of Mack the Knife (‘Is not asked and does not know’, in Eric Bentley’s version) is attached to Göring. Who knew nothing, or wasn’t asked. That in the dark sky when evening comes are hungry. And the years go by. He is not dead. He will never die. It is only that he’ll never come back. A coffee pot stays full and empty a chair. Always they entreat him to come home here. Please help us, we are lost. We can’t find the way anymore. The writing was a child’s. Their only action is vacillation. Their favourite phrase: it’s not yet certain. The doubt that is despair! Who cannot make up his mind! Begin anew with your very last breath. Kuhn and Constantine rather sniffily say they are not ‘fond of translation theory and leave it to others to describe our practice, as they wish’. Of course any established academic pursuit is fair game for scepticism, but it seems a little defensive to suggest you don’t care how your work is described or couldn’t find any such description interesting. In fact these new versions hold up very well to close study, especially in matters of rhyming, usually the downfall of translators. Where there are questions they concern not correctness or fidelity but intriguing matters of interpretation. One of the tasks of the translator, to borrow a phrase from Walter Benjamin, apart from helping us to read texts we couldn’t otherwise approach, is to show what different languages allow their speakers to do with words – and also what those languages do not allow. A good case arises with Brecht’s short poem ‘The mask of the angry one’, or is it ‘The mask of evil’? Mask of an angry demon, lacquered in gold. What a great strain it is to be angry. We might say, if we are being theoretical, that ‘feelingly’ is a bit too literal for mitfühlend, which is just the Germanic form of ‘sympathetically’; but that ‘hinting’ gets us closer than ‘indicating’ does to the indirection of the idea. Still, the real point of division (and of this comparison) obviously lies in the word böse, which also appears in the poem’s title. It signifies ‘mean’ or ‘naughty’ or ‘cross’ or ‘evil’, depending on context and intention. When Kafka uses it in his aphorisms (‘Evil is what distracts’; ‘Evil knows about good, but good knows nothing of evil’) ‘evil’ clearly works best, and we can back up this sense with the memory that ‘Der Böse’ is also a name for Satan, the Evil One. The proximity of the word in the poem to ‘demon’ might lead us to prefer Hays’s version. But then with Brecht we may not want the theological dimension of Kafka’s claim, and if we’re in an atheistic mood, we can think he just means ‘very very bad’. In any case, the word certainly also means ‘angry’. The situation becomes more delicate when Rilke, in the ‘Fourth Duino Elegy’, uses the word to say what he doesn’t understand about the mild manners of children who die young. For the phrase ‘nicht bös zu sein’ we need something that catches the sulkiness the children don’t have, and the literal ‘not to be angry’ used by C.F. MacIntyre, for example, won’t do the trick. I think Stephen Mitchell’s ‘not refuse to go on living’ is too metaphysical for these youngsters, but it does give a measure of what Rilke is getting ordinary language (and behind it the image of the behaviour of ordinary children) to do. Subscription information for the London Review of Books (24 issues annually for $49.95) is available HERE.